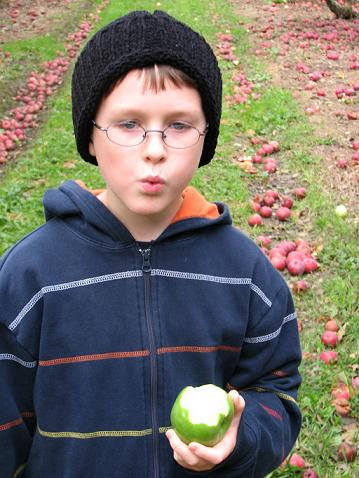 Kidlet and I went to an Apple Orchard on Saturday to pick our own apples! We've never done anything like it before and it was amazing! We had so much fun! I highly recommend apple picking on a cool Autumn day! As a result of said apple picking we came home with 24 pounds of apples. Luckily, many of my favorite bloggy people have been posting great apple recipes recently! 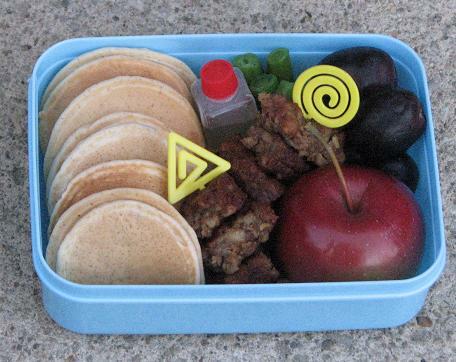 I made apple pancakes for dinner from a recipe from Disposable Aardvarks Inc. After dinner I used some more of the batter to make mini pancakes for bento! Kidlet has mini apple pancakes, soy sausage on skewers, a mini apple from the orchard, grapes, green beans, and a little bottle of syrup. 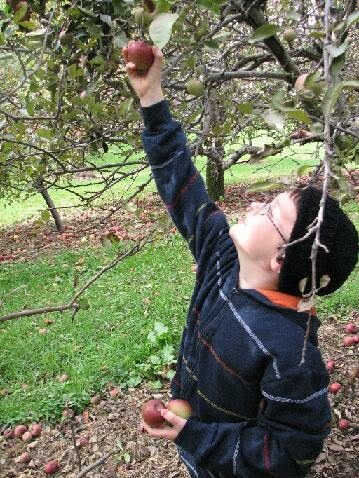 There were lots of low apples that Kidlet could reach on his own. Good thing because Mama got tired of boosting him up for the high ones! 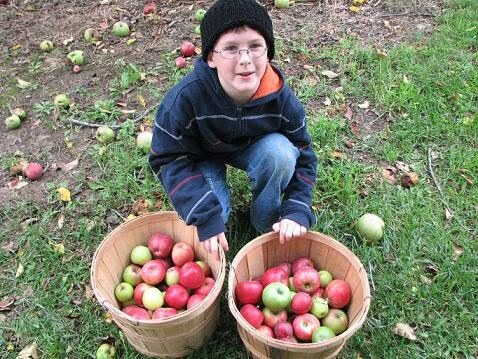 One of Kidlet's favorite parts was the fact that while in the Orchard you could eat as many apples as you wanted to try them out. Baskets of apples. You don't realize how many you really have when they are in a festive bushel like that. It's when you get them home and have them all over your kitchen counter that it sets in. So please if you have any good apple recipes let me have them! I have a lot of apples to play with! "It's when you get them home and have them all over your kitchen counter that it sets in" -- that made me laugh so hard. I just had this vision of you up to your neck in apples. I made an apple topping for pancakes / waffles a couple weeks ago (http://www.pcgirl.net/recipes/?p=3396) and it was really good. Big hit for the kiddo. No less sweet than his favorite syrup, but at least has some nutrients and fiber from the apples. I think it would freeze really well too. The little apple fits just perfectly!